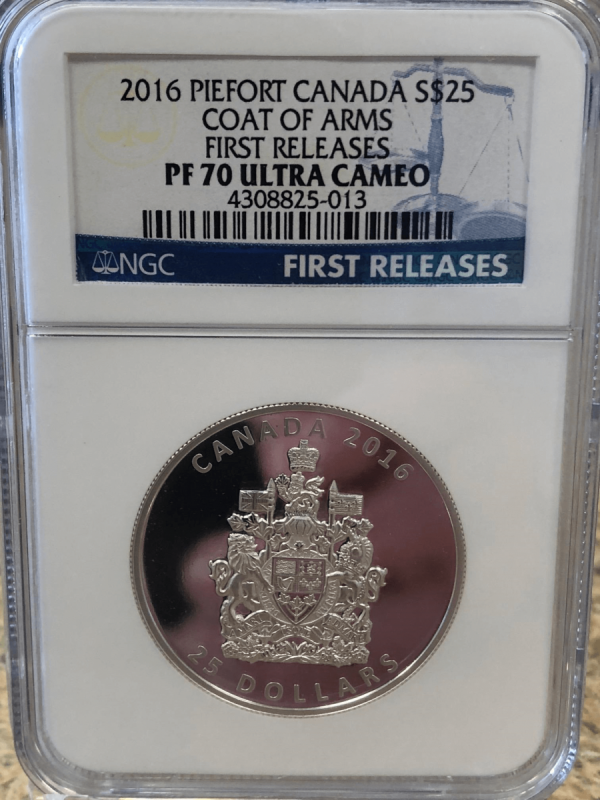 2016 Canada Piefort Silver 9999 Coat Of Arms Proof FIRST RELEASES (Graded within first 30 days of issue) Professionally Certified and Graded PF70 Ultra Cameo By NGC! INCREDIBLE Coin the detail on the coat of Arms is amazing and the Piefort design is remarkable. 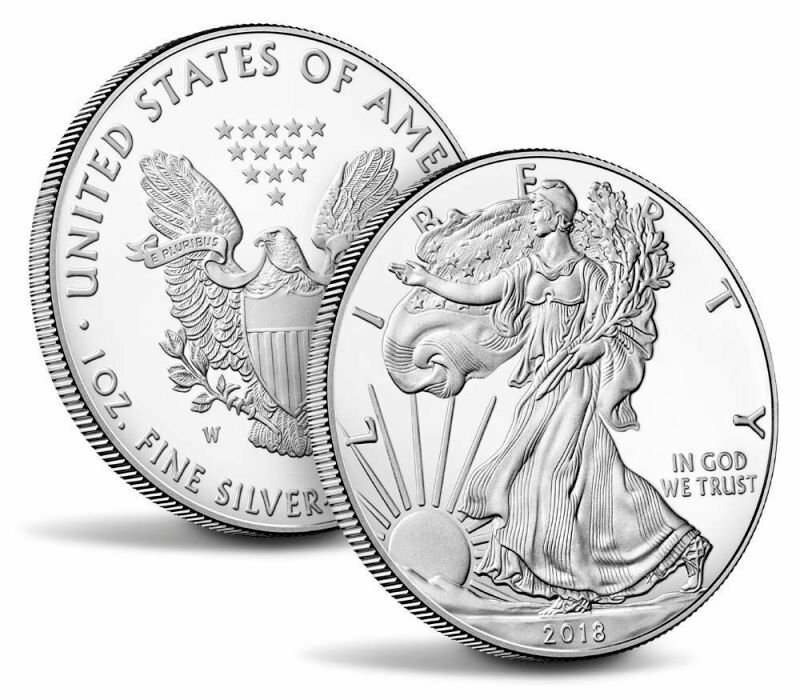 Super low mintage and population on this one! 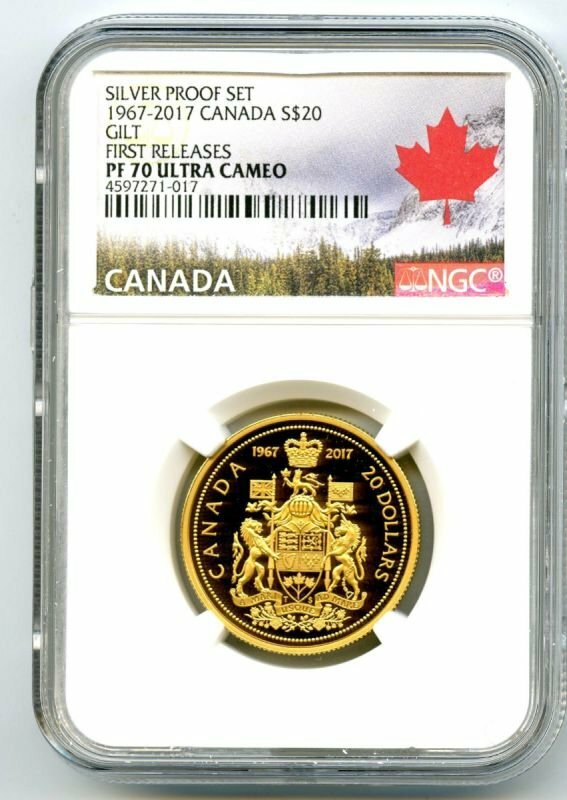 The reverse design features a faithfully detailed reproduction of the Coat of Arms of Canada. The base of the Coat of Arms features a garland of floral emblems—the English rose, the Scottish thistle, the Irish shamrock and the French lily—beneath a scroll that reads the motto of Canada, "A MARI USQUE AD MARE" (From sea to sea). 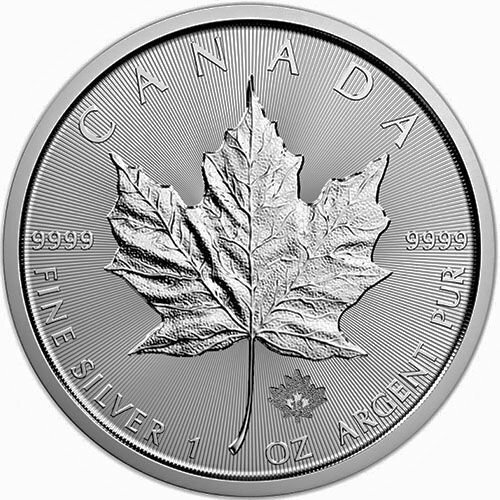 At the centre is the shield; in the upper quadrants lie the three royal lions of England, the royal lion of Scotland, the royal Irish harp of Tara and the royal fleurs-de-lis of France, while the bottom portion features a sprig of three maple leaves to represent Canadians of all origins. On either side of the shield are the supporters, which are based on those of the Royal Arms of the United Kingdom: to the left is a lion holding a lance with the Union Jack, while at right is a unicorn (a royal symbol of Scotland) holding the royal flag of France. The ribbon behind the shield reads "DESIDERANTES MELIOREM PATRIAM" (They desire a better country), while above the shield is the royal helmet draped with a mantle of maple leaves. Atop the royal helmet is the crest set on a wreath of twisted white-and-red cloth, and is comprised of a crowned lion holding a maple leaf in its right paw. Above the crest is the imperial crown that represents the monarch as Canada's Head of State. 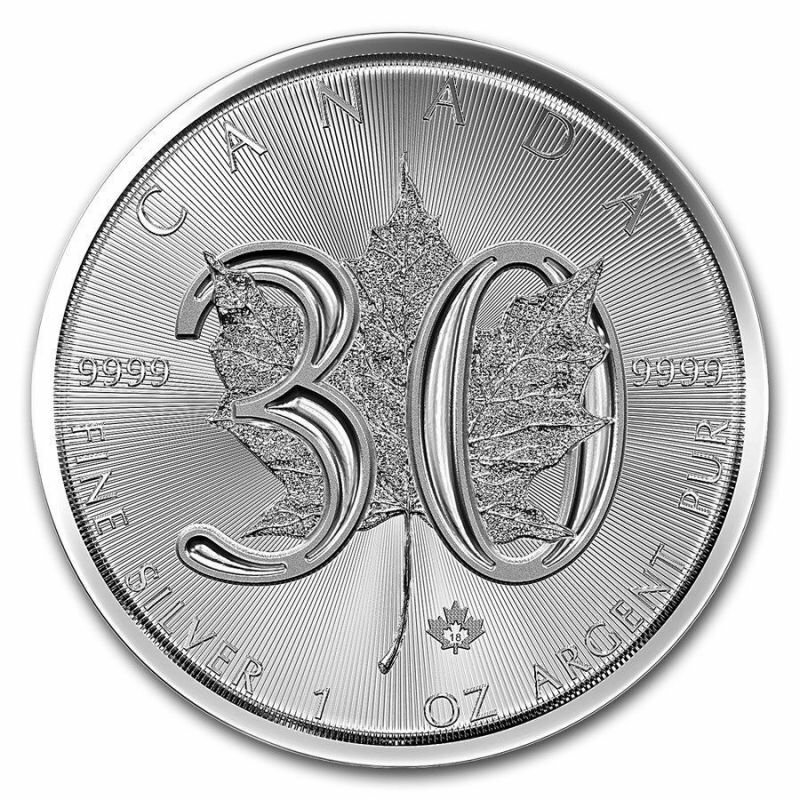 The reverse also features the engraved face value "25 DOLLARS", the word "CANADA" and the year "2016".